One of the most ubiquitous of appetizers, fried calamari can be found on most of America’s restaurant menus and, as one would expect, recipes abound for creating the dish. Some of these recipes marinate the squid first, while others only flour them before frying. Still others rely on a batter to coat the squid, and those batters may use any one of a number of liquids, from water to milk to beer. Absent a family recipe, what’s a blogger to do? Well, this blogger ran some tests. 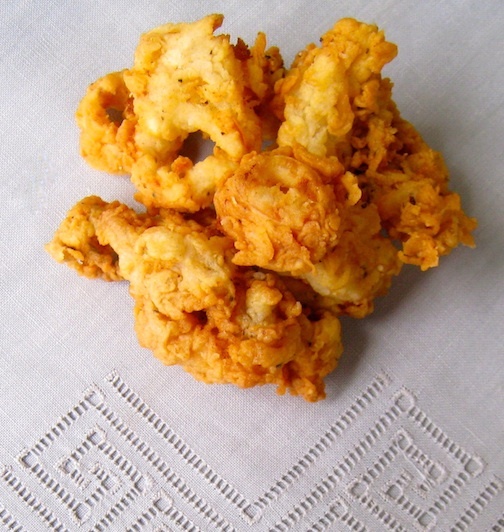 Armed with frozen squid, vegetable oil, and a dream, I set out to learn which recipe resulted in the best fried calamari. I took 2 calamari and did nothing but flour them before frying. Six other calamari were given a buttermilk soak for over an hour. Of those, 2 were floured and fried, 2 were dipped in a beer batter before frying, and the last 2 were coated with a water-based batter before frying. My objective was to determine which frying method was the best, so, I only used salt & pepper for seasoning. I didn’t want the results clouded by too many variables. So, then, how did they do? Well, all 4 preparations fried easily and the results were crisp, although some more so than others. Perhaps my least favorite was the beer batter-fried (lower – left). Although I’d like to try that batter again with chicken, shrimp, or onion rings, it was just too thick for the calamari. These tentacles were the worst of the bunch, a sorry mass of fried batter. 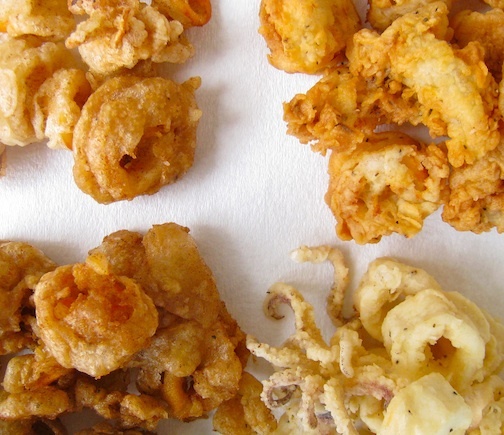 Next would have to be the calamari that were fried after only being dipped in flour (l – r). Although they were crispy and the tentacles were the best of all four, they were the least flavorful. As is the case with chicken, soaking the squid in buttermilk made a difference. 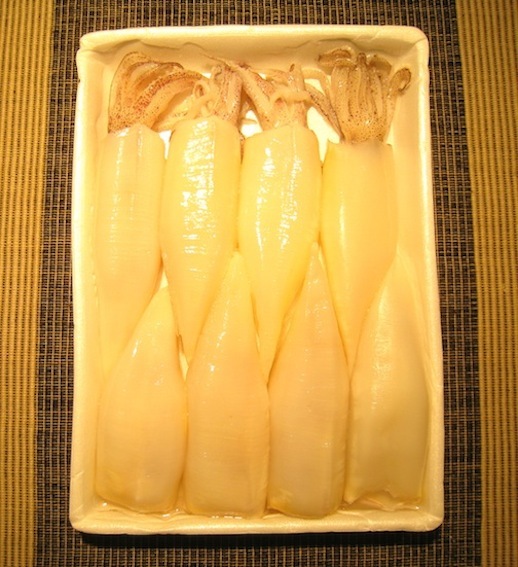 Next were the calamari that were dipped in a water-based batter (top – left). They were good but not good enough to overtake my favorite, the calamari that were soaked in buttermilk before being floured and fried (t-r). They benefited from the buttermilk and got extra points for ease of preparation and of frying — there was no messy batter to deal with. This, then, is the recipe I’ll be sharing today. Place buttermilk, calamari rings, and tentacles into a bowl and set aside for one hour. If longer, refrigerate until you’re ready. Heat oil in a large sauce pan or dutch oven over med-high heat. Place dry ingredients into a bowl and whisk to combine. Line a sheet pan with paper towels and pre-heat oven to 200*. When oil reaches 360*, remove some pieces of calamari from the buttermilk and allow excess liquid to run off before dredging them in the flour mixture. Place pieces, one at a time, into the hot oil. Work in batches. Do not overcrowd. Remove calamari when golden brown, about 90 seconds to 2 minutes, and place on paper-lined sheet pan. Sprinkle with salt and place in warmed oven. Repeat steps 5 and 6 until all calamari are fried. Serve immediately with lemon wedges and your favorite dipping sauce. The ingredient amounts listed-above are not set in stone. They are what I use and, as you can see, they bring a little heat to the dish. You can just as easily use more of one spice and less of another or, for that matter, skip one altogether in favor of some other. The point is no matter what spices you use, be sure to soak the calamari in buttermilk for optimum flavor. Do that and you won’t be disappointed. What if, after all of this, you decide you’d rather not fry your calamari? You can always try my Mom’s Calamari Salad recipe. Follow her directions and you’ll be rewarded with calamari rings that are tender but never rubbery and a salad that looks as fresh as it tastes. When I ran these tests, I put some thought into the testing but completely forgot about serving the calamari. I was mid-way through the frying when I realized I didn’t have any sauce for an accompaniment. I made a quick dipping sauce using 2 parts mayo, 1 part sour cream, the juice of a half-lemon, 1 grated garlic clove, and a little salt & pepper. It worked just fine although, if you have a low tolerance for garlic, you may wish to use 1/2 clove or none at all. This entry was posted in Appetizers (Antipasti), Seafood (Frutti di Mare), Vegetarian and tagged Cooking, Food, Italian, Recipes, Seafood by ChgoJohn. Bookmark the permalink. I make stuffed calamari each Christmas Eve, and love fried calamari but have never made it at home. Sounds great. You’ll be surprised at how easy this dish is to prepare and how tasty the results are. My family, also, has a recipe for stuffed calamari that are baked on a baking sheet and I’m currently toying with a recipe for stuffed calamari that are braised in a tomato sauce. Zia has mentioned yet another recipe for a tomato sauce with calamari that’s served over pasta. It looks like there will be more than a few calamari dinners in our future as we try to perfect these recipes before posting here. My very good friend stuffs her calamari bodies with a bread mixture, closes with a tooth pick, then slow cooks in a tomato sauce base for a few hours. The trick, only use a baby spoon of stuffing of they will EXPLODE! Experience speaks. Yes, we serve stuffed calamari 2 ways, 1 with sauce and another without. And you’re right. You do not want to overstuff them! Thank you for dropping by and commenting. Im trying this as we speak. No good places to get calamari like this around here. Wish me luck! You’ll do fine. I’m sure of it. I love fried calamari but have never made it at home. For all the reasons why I guess you tested so many recipes!! It’s my first choice for ordering an appetizer and I even rank my favorites by restaurant!! This is a terrific post having all your testing results in one! You surprise me, Linda. As accomplished as you are in the kitchen, I would have thought you’d be frying up calamari like most people pop popcorn. Well, regardless, once you try it and discover how easy it is you’ll be making ’em regularly — and, like me, wondering why you waited so long to try. I love fried calamari but only eat it on special occasions. I too have never tried making it at home, glad Linda mentioned you on her post. Now, I’ll have to make this for Christmas eve and surprise my dad! Thanks for sharing! You are going to be surprised at how quick and easy it is to do. It certainly was an eye-opener for me and, to be honest, I’ve not ordered it since at a restaurant. I’m sure your Dad will love it! Thanks for stopping by and commenting. Good luck! I’ve fried it in both , an electric “kettle” as well as a pot on the stove. Just don’t fill either more than half-way or you’ll risk the oil bubbling over. I think you’ll find that this is super easy to do and, if you’re like me, you’ll wonder why you didn’t start making it sooner. Thanks for stopping by and taking time to comment. Thank you so much for coming back to tell me of your discovery. There’s nothing like a side-by-side comparison to discover the best way to prepare something and you’ve proved that a deep fryer is the way to go. Glad you liked the buttermilk soak. I, too, like what it brings to the dish. And it sounds like your presentation was great, too! I hope you and yours have a wonderful Christmas! I saw some phenomenal looking squid at the store in Queens yesterday. Now I really wish I had bought them! Shame on me. Happy Holidays and Merry Christmas John! Eat, drink, and do it all over again. You have better will power than I. If I see ’em, I buy ’em and worry about the cooking later. Have a very Merry Christmas, Jed, to you & yours. Thanks, Kathryn. I was surprised how quick and easy it was to make fried calamari. I do it quite often now and haven’t bought it at a restaurant since. Give it a try and you’ll see what I mean. I TOTALLY ADORE CALAMARI WITH VARIOUS DIPS, MY FAVORITE WAY OF COOKING THEM IS TO DEEP FRY FOR 1.1/2 TO 2 MINS COATED IN A HERB SEASONED PANKO BREADCRUMBS OR IN A HERB “TEMPURA ” BATTER GOES WONDERFUL WITH EITHER A CHINESE DIPPING SAUCE OR A BLUE CHEESE DIP JUST NEVER EVER OVER COOK THEM !!! That sounds delicious! I’ll have to give it a try. Thanks for stopping by. It is easy, Christina, and I was surprised to find out, too. And you just cannot beat serving them fresh from your kitchen! As I replied to another commenter, I only make them myself now and haven’t ordered some from a restaurant in ages. Give them a try and you’ll see what I mean. Mmmm, going through your archives getting some ideas for dinner this weekend for my son’s birthday. This sounds like the perfect appetizer! These are good, Lisa, and far easier than I had imagined. The buttermilk soak really does work and it is up to you whether to use plain of seasoned flour for the coating. Good luck! Probably one of my favorite appetizers!! Mine, too. Once I made them at home for the first time, I never ordered them again in a restaurant. They are so easy to make and so much better when piping hot. Hi John, This is going to sound like a really weird question, but how much oil do you put in the pot? Should it be two inches deep? 3 inches? I’d really like to try to make these, but I’m really nervous about frying anything at home. I’ve only ever used an electric deep fryer before at pastry school way back in the day and haven’t touched one since. Other than that, thanks for posting the results of 4 different techniques. Now I know what the best way to batter calamari is! Thanks! Hey, Anne! If I’m serving 1 or 2 people, I use a 4 quart saucepan with 2 – 3 inches of oil. If I’m serving more than that, I use a deeper saucepan or Dutch oven. I never put oil past the halfway depth of either pan, as a precaution against boiling over, and I keep the pan lid nearby to smother flames, if necessary. Thankfully, I’ve never had either problem. Thanks for letting me know! It really does seem easy, but kind of scary too. So, thanks for the heads up on never filling higher than halfway to cut down on the risk of boiling over. eek! Thanks for the avice. We can never be too careful when you’re dealing with a pot of hot oil and flame. John its time for the calamari!!! Merry CHRISTmas!! Yes it is, Maria! They’re on my menu for this evening. I hope you and everyone dear to you have a wonderful Christmas and may 2013 be a good year for us all! same to you and yours…Buon Natale! I hope you make it for him. It is far easier to make than one would imagine. I really do like it. Hello, Jeanette. You’ll be surprised how easy this is to make and how good the result. They brown surprisingly quickly and you’ll be serving them in no time. I hope you, too, enjoy them. As what my son would say when he discovers something exciting, Oh, my Gosh! I always wanted to find a perfect Calamari recipe and today, it just fell on my lap…or computer. Thanks for a delicious treat! Have a great weekend. I hope you do try to prepare these. It s such an easy dish. You’ll wonder why you haven’t done it before. John – as usually happens – you made me laugh!! Actually, at the hotel there weren’t lots of Americans – and I just kinda feel that only Americans (like myself) would call the poor man Mr. Calamari!! Don’t feel bad. My Dad’s name was “Marino”. You should have heard the many ways it was mispronounced. He never let it get to him and had a good laugh about it. Oh, I love a nice thorough test like this! Wonderful job – I usually just give my calamari a quick pan fry, but now I know the best way to fry them! And they’re so good fried, I need to do some, and soon. Buttermilk so often is a winner, isn’t it? Superb post – thanks. Thanks, John, for you kind words of encouragement. These calamari turned out to be far easier — and tastier — than I had imagined. I haven’t bought fried calamari from a restaurant in years, as a result. Yes, buttermilk works wonders in the kitchen. I used to lament having to buy it by the quart because it often went to waste. Then, at a cheese making site, I read that buttermilk could br frozen. Now I use the excess to fill ice cube trays and no more waste. I’m so pleased you posted this recipe! You’re right, fried calamari is often on the menu here in the States, but it’s often deep fried from a frozen state and, therefore, a bit rubbery. There’s nothing like calamari prepared right before you eat it! I have a quick story – when we lived in Malta we used to love going to a hotel (on the Maltese island of Gozo) where the manager’s name was Mr. Camelleri – I can’t tell you how many times I called him Mr. Calamari !! I’m glad you like this recipe, Cecile. It is so quick and easy with such great results that I no longer order it when I’m out. I hope the guy had a good temperament. I imagine that he was called Mr. Calamari all of the time and it would be a shame if he let it bother him. I’ve used rice flour for soft shell crabs and they came out wonderful. I might give it a try for the calamari. This is on my alltime favourites, so yummy! Mine, too, and it’s surprisingly easy to prepare. TY, TY, TY for the Calamari recipe. Now I can make it at home. Are you ok if I were to reblog your recipe? I can’t wait to give this recipe a try. Usually I only get calamari at a restaurant but this recipe looks as though I can get top restaurant quality right at home! And – at a restaurant you’re never sure if the calamari are frozen ! Hi Maria – I’m a BIG fan of John’s too !! Aw, thanks, Cecille! You’re too kind. Thank you so much. I hope you do try and enjoy this calamari as much as we do. Remember, you can add some hot sauce to the buttermilk, if you want a little heat. Please let me know what you think. Good luck! Oh yes, this is the recipe, you will not have to look any further…Hi John!! Et, bonsoir mes amis!! ( I had to look up ‘amis’.. just to be sure I shouldn’t be writing ‘amies’. It turns out that, because I’m writing to 1. plural 2. male & female it’s ‘mes amis’. If I were talking to more than one female, then it would be ‘mes amies’. I think French is sooo difficult. Then again, Italian also has it’s masculine & feminine ‘rules!. Guess what – not long ago I discovered that English used to have both masculine and feminine spellings – aren’t we all happy they got rid of THAT!! I am truly sorry for the delayed reply. I’ve never seen calamari stuffed and then fried. We also stuff them but then either braise them in a tomato sauce or bake them. We lightly sauté the tentacles, chop them, and place them in with the stuffing. I wish I cold be of more help but I really have not seen calamari cooked this way. My recipe here is to make fried calamari rings like one gets at a restaurant as an appetizer. I do hope you find a recipe. It sounds like a delicious way to serve calamari. Grandmas always know best! Good luck and Merry Christmas. I have made calamari on Christmas Eve for the last 15+ years and by following this recipe, this has been by far the best it has ever come out. Thank you. Thank you very much. I’m so glad that you like it. I really like your batter recipe on this. I use it for other fish. I love these old basic recipes. Thanks for sharing. Thank you. Sometimes simple is best and that’s certainly the case here. ooh! Looks crispy and delish! That it is! I know you’re GF. Do you think rice flour or corn flour would make a good substitute? I am so glad you made this experiment John. I have been working around to find the best dipping liquid (eggs or flour) and buttermilk never crossed mind. This looks amazingly crispy and as fried calamari tops my list of fav food, I am going to try this for sure. I’m glad I could be of help. Have a great holiday and I hope you enjoy the calamari as much as we all do. What dedicated research. I dare say, no one can resist a little fried calamari! You are so right! It surprised me to learn how easy these are to make and I’ve not ordered them from any restaurant since. Thank you for dropping in and for taking the time to comment. The horror, the horror of it all John. My goodness just think of the things we were eating, especially in an Italian home…just try not think about it and I think we will both be okay. Have a super week. I cooked this on Friday night, soaking the calamari for 1 hour. It was very tender, the coating was firm and the garlic powder gave it a different twist. I fried a little red chilli and spring onion to sprinkle over top. It was very nice thank you. I’m glad that you enjoyed it, Merryn, and thank you for coming back to tell me. Hope your holidays are wonderful. I’m using this recipe add part of our feast of seven fishes tonight and in trying to prep before church so that we can eat at a reasonable time. Can the squid soak to long in the buttermilk? If so, what’s the max time it can be in there? I’ve let them soak over an hour with no problems. Buttermilk is a tenderizer but I don’t think it will damage the rings. I’d go for it. Your dinner sounds fantastic. Good luck and Merry Christmas!